Increased water flow makes these top-of-the-line water regulators real winners! Made of 304 stainless steel. Lead-free unit conforms to CA and VT lead laws for drinking water fixtures. Protects your RV plumbing against high pressure. Conforms with federal and state laws for drinking water fixtures. 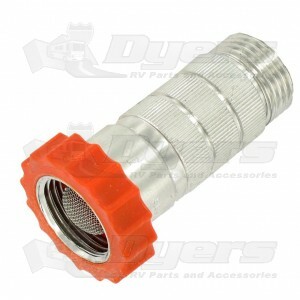 Protects RV plumbing against high pressure. 15% to 20% more flow than standard regulators. Regulates incoming water pressure to 50-55 psi.